Fifty years after designing and printing her first political poster, Jane Norling continues making visual art to illuminate and elevate the human condition. Jane’s guide is the ongoing collective push for equal rights for all people. Her posters and murals have advocated for strong communities practicing fair inclusion and economic justice, broad education, vibrant cultural life, people-based health practices, spiritual understanding, real public spaces, environmental preservation, in beauty and dignity. Love of the natural world–and observation of its human imprint–powers Jane’s landscape and abstract paintings. Alameda County Water, her 2016 Alameda County commission– a six-part ceramic-print glass installation in an Oakland CA social services building–brings together California’s coastal landscape with the interior workplace environment of social services provision, engaging clients, staff and public with nurturing artwork. Jane’s posters are featured in the traveling exhibition Women’s Rights Are Human Rights: International Posters on Gender-based Inequality, Violence and Discrimination, and in Get with the Action: Political Posters from the 1960s to Now at SFMOMA, winter 2018. She is a contributing artist for the 2018 Justseeds Poor People’s Campaign Portfolio. Jane Norling lives and works in San Francisco Bay Area and Chicago. She balances painting/print commentary on states of collapse with immersion in the ever-transcendent power of people to move forward. Jane Norling majored in painting (color field abstraction) and printmaking at Bennington College, 1968. After working in book design at Random House, NY, Jane left for San Francisco in 1970, drawn by the expansive landscapes and active political environment of California. She joined new publishing and print collective Peoples Press, transferring typography skills gained at Random House into serving community print/design needs while publishing materials focused on building justice in the US and ending the US war in Vietnam. Support of international anticolonialism efforts in the global south was a significant mission of Peoples Press, including printing a quarterly digest for North American readers of articles from Tricontinental, the international publication of OSPAAAL (Organization of Solidarity of the Peoples of Asia, Africa, and Latin America), headquartered in Havana, Cuba. In 1972, Jane was invited to work at the OSPAAAL design department where she designed an international solidarity poster supporting Puerto Rico. Early 1970s, fueled by years of social uprising, was the beginning of a vibrant community mural movement in San Francisco, with artists of diverse neighborhoods responding to related political relalities by painting major works on outdoor walls. 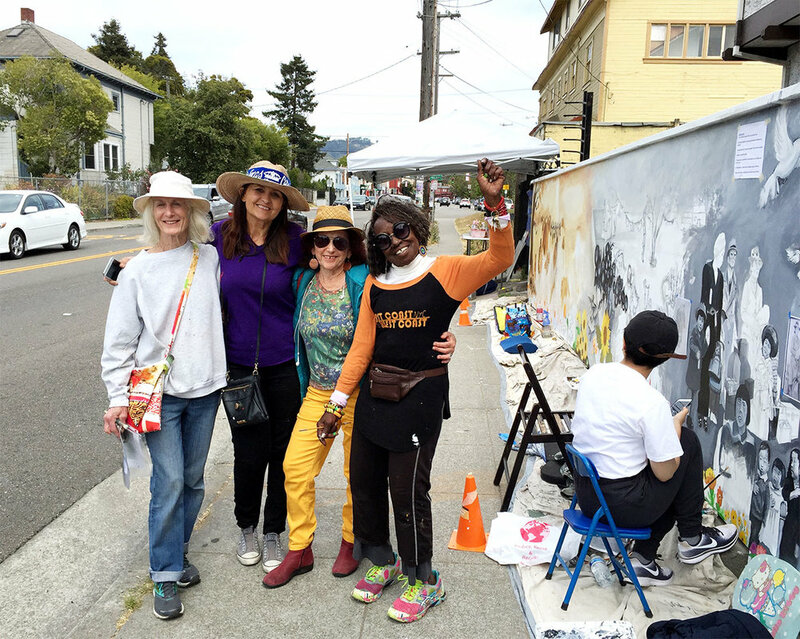 The anti-imperialists of the Haight Ashbury Muralists–Miranda Bergman, Jane Norling and Arch Williams–designed, directed and painted murals focused on educating hidden US and San Francisco histories as well as expressing community aspirations for a better world. Communication among muralists working around the city and the country was strong and vital, including a national publication Community Murals Magazine. In the mid-70’s, on staff of the San Francisco Neighborhood Arts Program Print & Design shop, Jane designed and printed colorful small posters using Gestetner technology for SF cultural groups producing free events in their communities. She continued to paint public murals and and receive private commissions. 1980 to present, Jane Norling Design has produced graphic design and illustration for California and national organizations and electoral and justice campaigns dedicated to the public good. 1988 to present, Jane has kept a painting studio in Oakland, California. 2016 she launched an accompanying studio in Chicago. The Invisible Becomes Visible, South Berkeley Community Mural. From left to right: Edythe Boone, director, Miranda Bergman, Tammy Artis, Jane Norling. Painted by local unshelterd residents, neighbors, school children, muralists. Berkeley, California, 2018.